Return to Home > ZMA>Activlab - ZMA - 120 caps. 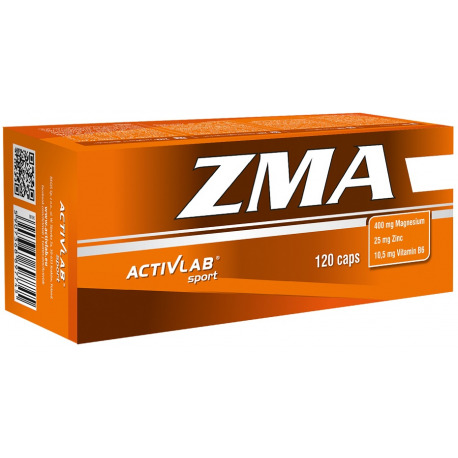 Activlab - ZMA - 120 caps. ZMA, a combination of zinc, magnesium and vitamin B6, is a product designed for people who intensely pursue various sports disciplines. Magnesium helps maintain a correct energy metabolism, aids muscle performance and supports protein synthesis. Zinc helps maintain correct testosterone levels in the bloodstream. Vitamin B6 aids correct metabolism of protein and glycogen, while effectively enhancing the regulatory mechanism of hormonal activity. ZMA is particularly recommended for professional sportsmen pursuing various sports disciplines, especially during periods of excessive physical effort, as a dietary supplement improving overall quality of strength training and regular recreation. Magnesium diglycinate, Zinc diglycinate, Anti Caking Agent (E470b), Vitamin B6 (Pyridoxine HCL), Shell Ingredients (Gelatin, Colorants (E171, E132)). ZMA Recommended Use: As a dietary supplement, take 1 capsule 3 times per day with meals. Warning: Do not exceed the recommended daily dosage. This product must not be used as a substitute of a varied diet. Unopened, can be stored at room temperature in a dry, cool place. Keep out of reach of children. Allergy Alert: May contain traces of soy, wheat and nuts.